English language learners frequently get blamed for the low performance of many schools. This report considers contextual variables--"such as high student-teacher ratios, high student enrollments and high levels of students who live in poverty or near poverty"--as what's driving low achievement. To this, I would add the absence of well-funded, staffed and designed bilingual or dual education programs that we know help reduce the gap. A Pew Hispanic report released today examines the role of schools in the achievement gap of the nation's four million English language learner public school students. Analyzing newly available standardized test data, the report finds that students designated as English language learners (ELL) tend to go to public schools with low standardized test scores. However, these low levels of assessed proficiency are not solely attributable to poor achievement by ELL students. These same schools report poor achievement by other major student groups as well, and have a set of characteristics associated generally with poor standardized test performance-such as high student-teacher ratios, high student enrollments and high levels of students who live in poverty or near poverty. When ELL students are not isolated in these low-achieving schools, their gap in test score results is considerably narrower. The 1980 census recorded the foreign born from Mexico as the largest immigrant group in the United States, and this group remains the largest today. In 2006, more than 11.5 million Mexican immigrants resided in the United States, accounting for 30.7 percent of all US immigrants and one-tenth of the entire population born in Mexico. While Mexican immigrants are still settling in "traditional" destination states like California and Texas, over the last 10 to 15 years, the foreign born from Mexico, like other immigrant groups, have begun moving to "nontraditional" settlement areas. These include states in the South, such as Georgia and North Carolina, as well as Midwestern states, such as Nebraska and Ohio. This spotlight focuses on the foreign born from Mexico residing in the United States, examining the population's size, geographic distribution, and socioeconomic characteristics using data from the US Census Bureau's 2006 American Community Survey (ACS) and 2000 Decennial Census, and the Department of Homeland Security's Office of Immigration Statistics (OIS). * Mexican immigrants represented the largest single immigrant group residing in the United States in 2006. 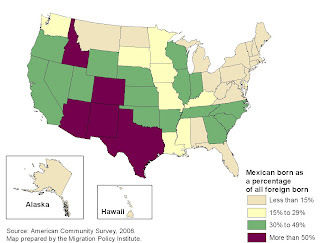 * More than 83 percent of the Mexican born resided in just 10 states. * More than seven in 10 immigrants residing in the state of New Mexico in 2006 were Mexican born. * The size of the Mexican immigrant populations in South Dakota, Louisiana, Alaska, and Ohio more than doubled between 2000 and 2006. * More than a quarter of all Mexican foreign born in the United States arrived in 2000 or later. * Three-quarters of Mexican immigrants in 2006 were adults of working age. * Men accounted for the majority of the Mexican-born population living in the United States in 2006. * About one in five Mexican immigrants were naturalized US citizens in 2006. * Nearly 75 percent of Mexican immigrants in 2006 were limited English proficient. * Three in five Mexican immigrants had no high school degree. * Mexican immigrant men were more likely to participate in the civilian labor force than foreign-born men overall and Mexican immigrant women. * Forty percent of Mexican-born men were employed in construction, extraction, or transportation occupations. The foreign born are individuals who had no US citizenship at birth. The foreign-born population includes naturalized citizens, lawful permanent residents (LPRs), refugees and asylees, legal nonimmigrants (including those on student, work, or other temporary visas), and persons residing in the country without authorization. * The Mexican born accounted for about 27 percent of all lawful permanent residents living in the United States in 2006. * Almost nine in 10 Mexican-born lawful permanent residents were family-sponsored immigrants. * Mexican-born lawful permanent residents accounted for nearly a third of all those eligible to naturalize as of 2006. * In 2006, more than half of all unauthorized immigrants in the United States were from Mexico. Mexican immigrants represented the largest single immigrant group residing in the United States in 2006. There were 11.5 million foreign born from Mexico residing in the United States in 2006. The population has increased more than fivefold since 1980, when the decennial census counted 2.2 million Mexican immigrants. Up until 1980, the foreign born from Mexico ranked behind foreign-born groups from Europe and Canada in terms of size (see Table 1). The 2.2 million Mexican born in 1980 were almost similar in size compared to the next three origin groups combined: German born (849,384), Canadian born (842,859), and Italian born (831,922). The share of the foreign born represented by Mexican immigrants doubled from 7.9 percent in 1970 to 15.6 percent in 1980 and then almost doubled again to 30.7 percent by 2006 (see Table 1; see also the pie charts showing the top 10 countries of birth of immigrants residing in the United States over time here). The remaining seven states with the largest numbers of Mexican immigrants include Arizona (608,645), Florida (303,345), Georgia (276,494), Colorado (254,844), North Carolina (254,830), Nevada (230,314), and New York (230,299). Together, these 10 states accounted for 83.3 percent (or 9,619,766) of all Mexican-born residents in the United States in 2006. Los Angeles-Long Beach-Santa Ana, CA is the metropolitan area with the largest number of Mexican born (1,902,623 or 16.5 percent), followed by Chicago-Naperville-Joliet, IL-IN-WI (699,447 or 6.1 percent) and Dallas-Fort Worth-Arlington, TX (607,180 or 5.3 percent). These three metropolitan areas accounted for 27.9 percent of the 11.5 million Mexican immigrants in 2006. The top 15 metropolitan areas for Mexican immigrants were home to more than 6.6 million Mexican immigrants in 2006 (see Map 1). More than seven in 10 immigrants residing in the state of New Mexico in 2006 were Mexican born. Mexican immigrants accounted for a large share of the total immigrant population in Western and Southwestern states (see Map 2). 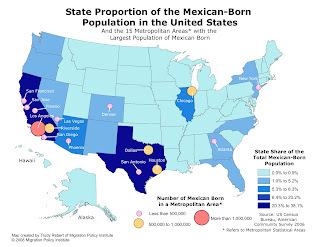 The Mexican foreign born made up 72.8 percent of all immigrants in New Mexico, 65.5 percent of all immigrants in Arizona, 62.5 percent of all immigrants in Texas, and 57.6 percent of all immigrants in Idaho. By contrast, Mexican-born individuals accounted for only 1.3 percent of the immigrant populations of Maine and Massachusetts and less than 1 percent of Vermont's foreign-born population. The size of the Mexican immigrant populations in South Dakota, Louisiana, Alaska, and Ohio more than doubled between 2000 and 2006. The states that experienced the largest increases in their Mexican foreign-born populations between 2000 and 2006 included mainly states that had relatively smaller numbers of Mexican immigrants in 2000. The top five states with the largest percent change in their Mexican immigrant populations were South Dakota (151.3 percent, from 1,399 in 2000 to 3,516 in 2006), Louisiana (130.6 percent, from 9,321 to 21,496), Alaska (129.7 percent, from 2,743 to 6,301), Ohio (110.1 percent, from 20,551 to 43,178), and New Jersey (86.9 percent, from 67,667 to 126,488). More than a quarter of all Mexican foreign born in the United States arrived in 2000 or later. Of the total 11.5 million Mexican foreign-born in the United States in 2006, 27.9 percent entered the country in 2000 or later, 34.1 percent between 1990 and 1999, 20.4 percent between 1980 and 1989, 11.5 percent between 1970 and 1979, and the remaining 6.0 percent entered prior to 1970. Three-quarters of Mexican immigrants in 2006 were adults of working age. Of the Mexican immigrants residing in the United States in 2006, 10.1 percent were minors (under age 18), 78.3 percent were of working age (between ages 18 and 54), and 11.6 percent were seniors (age 55 or older). Of the foreign-born population in the United States in 2006, 8.1 percent were minors, 60.2 percent were of working age, and 22.1 percent were seniors. Men accounted for the majority of the Mexican-born population living in the United States in 2006. Of all Mexican immigrants residing in the country in 2006, 55.9 percent were men while women accounted for 44.1 percent. About one in five Mexican immigrants were naturalized US citizens in 2006. Among the Mexican foreign born, 21.7 percent were naturalized US citizens in 2006, compared to 42.0 percent among the overall foreign-born population. Nearly 75 percent of Mexican immigrants in 2006 were limited English proficient. Only 2.9 percent of the 11.4 million Mexican immigrants age 5 and older reported speaking "English only" while 22.7 percent reported speaking English "very well." In contrast, 74.5 percent reported speaking English less than “very well,” which is higher than the 52.4 percent reported among all foreign born age 5 and older. Three in five Mexican immigrants had no high school degree. In 2006, 60.2 percent of the 8.9 million Mexican-born adults age 25 and older had no high school diploma or the equivalent general education diploma (GED), compared to 32.0 percent among the 30.9 million foreign-born adults. On the other end of the education continuum, only 5.0 percent of Mexican immigrants had a bachelor's or higher degree, compared to 26.7 percent among all foreign-born adults. Mexican immigrant men were more likely to participate in the civilian labor force than foreign-born men overall and Mexican immigrant women. Of Mexican-born men age 16 and older (5.9 million) in 2006, 85.7 percent were engaged in the civilian labor force compared to 79.3 percent of all foreign-born men. In contrast, Mexican foreign-born women age 16 and older (4.6 million) were less likely to be in the civilian labor force (50.2 percent) than foreign-born women overall (55.1 percent). Forty percent of Mexican-born men were employed in construction, extraction, or transportation occupations. Among the 4.9 million Mexican-born male workers age 16 and older employed in the civilian labor force, 40.2 percent reported working in construction, extraction, or transportation occupations. This is a higher percentage than among all foreign-born male workers (26.8 percent) (see Table 2). Both Mexican foreign-born men and women were significantly less likely to be employed as managers, scientists, or engineers than foreign-born men and women overall, but they were more likely to be working in service or farming occupations. The Mexican born accounted for about 27 percent of all lawful permanent residents living in the United States in 2006. According to OIS data, the Mexican born accounted for 27.3 percent (3.3 million) of the 12.1 million lawful permanent residents (LPRs, also known as green card holders) living in the United States in 2006. The two next-largest LPR groups were the Filipino born (4.5 percent or 540,000) and Indian born (4.2 percent or 510,000). In 2007, there were 148,640 Mexican born who were granted LPR status. They made up 14.1 percent of the 1.1 million foreign nationals who became LPRs in 2007. Almost nine in 10 Mexican-born lawful permanent residents were family-sponsored immigrants. Of the 148,640 Mexican-born LPRs in 2007, 58.8 percent (87,466) were immediate relatives of US citizens, 30.6 percent (45,422) were other family-sponsored immigrants, 8.0 percent (11,900) were employment-sponsored immigrants and their immediate family members, and 2.6 percent (3,852) were other categories of LPRs. Mexican-born lawful permanent residents accounted for nearly a third of all those eligible to naturalize as of 2006. Mexican-born LPRs are the largest group of permanent residents eligible to naturalize. According to OIS estimates, of the 8.3 million LPRs eligible to apply for citizenship as of 2006, 2.7 million (32.1) percent were born in Mexico. OIS also reports that compared to LPRs from Asia and Europe, Mexican LPRs have been historically slower to naturalize. In 2006, more than half of all unauthorized immigrants in the United States were from Mexico. OIS has estimated that there were about 11.5 million unauthorized migrants in 2006; 6.6 million or 57.0 percent were Mexican born. Check out the full report: "Predicting Success, Preventing Failure: An Investigation of the California High School Exit Exam,"
After the sounds of "Pomp and Circumstance" have faded, Californians will find out just how many high school seniors actually graduated this year. A significant number will be denied diplomas because they failed the California High School Exit Exam. As the only part of the state's accountability system with direct consequences for students, the exit exam has been the focus of legal and political challenges from the beginning. This year's results are unlikely to quiet the controversy. But there is common ground even in the highly charged debate between advocates, who see the test as a tool to ensure student achievement, and opponents, who feel it is unfair to English language learners and special education students. Both want answers to the same questions: Who is likely to fail? What can be done to help them succeed? Our research for the Public Policy Institute of California answers the first question. Working with the San Diego Unified School District - whose student population mirrors the state's - we developed a highly accurate method for predicting performance on the exam, based on grades, test scores and teachers' ratings of student behavior over many years. We identified children as early as fourth grade who would later fail the exam. California taxpayers pay for tutoring for students who reach 12th grade without passing the exam. A new law also provides two years of help after 12th grade to anyone denied a diploma for failing the exit exam. Our research suggests that these efforts may not be enough. In San Diego, almost none of the seniors who failed the exam in 2006 took it and passed the following year. Rigorous studies are needed to determine the effectiveness of these tutoring programs on a statewide basis. Because we can identify elementary and middle school children likely to fail the exit exam in high school, policymakers should develop an early warning identification system and consider spending tutoring dollars before struggling students reach their senior year in high school. This could be done, in part, by giving public school districts more flexibility to spend money that can now only be used for students in 12th grade or for those who finish 12th grade but fail the exit exam, and thus are denied a diploma. Policymakers should also consider focusing on the many students who barely pass the exam. Although the high overall pass rate is good news, it overstates the success of California students. They get six opportunities to pass the test, beginning in 10th grade. In 2006, about 41 percent of 10th graders in San Diego failed the math section, the English section, or both. This is a troubling result for an exam that covers middle-school math and 10th-grade English. Also worrisome: Many who later passed barely made the minimum score. What programs work best to improve student achievement? We recommend that the state commission carefully designed studies in a limited number of schools to determine the approaches - after-school reading programs, specialized teacher development programs, or others - that most benefit students. The timing of such support, that is, the best grades during which to implement such programs, also deserves rigorous study. As the state's leaders confront an immediate budget crisis, they may hesitate to spend money now to improve graduation rates in five or six years. But identifying and helping younger students likely to fail in high school may also have significant shorter-term benefits. A child who improves reading skills in elementary school is likely to do better in other subjects and to be a more engaged student. California has a long history of implementing expensive educational reforms without a solid research basis, such as the class-size reduction program that began in 1996. Initiating small-scale tests that provide policymakers with information to make informed decisions is far less expensive. And adopting such forward-looking measures will put California on track to be a national leader in education reform. About 1 student in 10 statewide failed the test in 2006, the first year the exam was required - and this number improved only slightly last year. Sources: San Diego, authors' calculations; statewide data available at dq.cde.ca.gov/dataquest. PORTLAND, Ore. -- When Oregon education officials set out to devise a graduation testing requirement for high school students, they looked to other states for inspiration - on what not to do. In neighboring California, dropout rates soared the first year the state required high schoolers to pass a test to get their diploma. In Texas, 40,000 disgruntled students were dispatched to summer school in 2007 after not passing the state test. And in Washington state, lawmakers simply canceled plans to require exiting students to pass a single, comprehensive math test, after fears surfaced that thousands wouldn't measure up. "We didn't think any one test should determine whether someone gets a diploma," said Duncan Wyse, vice-chairman of the Oregon Board of Education. So board members chose a different route. This week, they approved a a plan that lets students pick from three options: a national test, state assessments or a local version, such as a student portfolio, to show colleges and employers they have mastered reading, writing, applied math and speaking skills. Passage on any one of the three, along with fulfilling course requirements, would guarantee a diploma. The plan makes Oregon one of several states moving past the "one-size-fits-all" high-stakes testing that became commonplace in many U.S. high schools in the 1990s. In Pennsylvania, the Board of Education is considering a three-pronged approach similar to Oregon's plan, while in Maryland, students who can't pass the state tests could be allowed to do a senior project instead. But some say such choices allow some students - and states - to take the easy way out. Daria Hall, assistant director for K-12 policy at Education Trust, a Washington, D.C.-based nonprofit that advocates for poor and minority children, points to New Jersey, where up to 80 percent of students at high schools in poor cities like Newark and Camden receive alternative diplomas after not passing the state tests. The number falls to about 3 percent in wealthy areas like Princeton, N.J., she said. In most states, she said, the exit exams test skills students learned in ninth and tenth grades. That's basic enough, she said, that there should be no need for the safety net of alternate assessments, which can be put in place for political cover. "These young people want to walk across the stage with their friends and their classmates," she said. "But why isn't there the same level of outrage that students were not able to pass these basic competency assessments in the first place?" Oregon school board members, though, say they'll work hard to ensure that the local option, with local teachers judging their own students, doesn't become an easy way out. "We will provide a common scoring guide, and review students' work to make sure there is consistency," with periodic spot-checks, Wyse said. The trend is definitely moving away from a single, high-stakes test, said Jack Jennings, president of the Center for Education Policy in Washington, D.C., especially in states that have long traditions of local control for school districts. There's also the No Child Left Behind factor, he noted. That's the Bush administration's education reform law, which has required yearly testing from grades 3-8 and in grade 10, with consequences for schools where enough students don't make progress. The law is unpopular with many teachers and principals, and has sparked a backlash against testing that didn't exist a decade or so ago when most states were considering exit exams, he said. That's not to say that high stakes tests are totally out of fashion. Twenty-three states required the class of 2008 to pass tests to graduate from high school. Most states give students multiple chances to take the tests and many, including California, have set aside millions of dollars to pay for remedial coursework aimed at getting more students to pass the tests. Still, John Warren, an associate professor of sociology at the University of Minnesota, who has done extensive research on exit exams, said his research has proved few tangible benefits and suggested that testing requirements will result in more dropouts. "There is no empirical evidence about whether alternate formats will result in better outcomes than one-size-fits-all," he said. "Unless there are additional resources for things like summer school, you are still relying on motivation alone." Put down that No. 2 pencil and grab a paint brush. Or design a research project. Or go to work in a homeless shelter. A growing number of people in Ohio are asking whether one-size-fits-all standardized tests - the cheapest and most efficient way to meet federal No Child Left Behind accountability requirements - are the best and fairest way to measure academic progress. In April, Ohio education officials secured a $1.3 million grant to explore alternative assessments, such as portfolios, senior projects, journals, small-group collaborations or teacher observation. The idea: Give students an assessment that requires them to accomplish complex or significant tasks rather than forcing them to choose from multiple-choice responses. And earlier this month, a statewide student group, Ohio Youth Voices, asked Gov. Ted Strickland to consider alternatives to the Ohio Graduation Test. Currently, Ohio students have to pass the five-part exam by the end of their senior year to get a diploma. "Schools once renowned for their unique learning programs are becoming nothing more than soulless factories that churn out those that can excel at standardized tests while discarding those who can't," the leaders of the group, Shaw High School senior Jonathan Lykes and Federal Hocking High School senior Mason Pesek, wrote to the governor. "We'd really like to talk to the governor and work to come up with another system," Pesek said in an interview. "Essentially, the current system is really failing Ohio's students." Strickland spokesman Keith Dailey said the governor's office was reviewing the letter. "The governor is aware that concerns have been raised about the Ohio Graduation Test," Dailey said. "He is open to exploring other types of assessments to address those concerns as part of the education reform process." The exploration will begin in September when teams of educators from districts across the state will gather in Columbus and be asked to choose from a smorgasbord of alternative assessments and field-test them during the coming school year. The theory: Since students learn in different ways, shouldn't they also be tested in different ways? "Our current tests are just one measure of learning, just like in medicine, a blood test is one measure," said State Superintendent Susan Tave Zelman. "We see this as giving kids multiple ways to demonstrate their competence and still have academic rigor," she added. "I think we can do this in Ohio and lead the rest of the country." While Ohio might be positioning itself as a trend-setter in alternative assessments, the concept is hardly new. In the early 1990s, Vermont required all eighth-graders to complete a portfolio assessment in both English and math. Kentucky overhauled its testing program in 1998 and used an assessment that combined essays, multiple-choice questions and a writing portfolio. "It was a very hot topic," said Ron Dietel, assistant director of the National Center for Research on Evaluation, Stan dards and Student Testing at UCLA. "There was a general concern that standardized tests really didn't show what students know." Cincinnati was among the most progressive districts in the country on alternative, or performance-based, assessment. Students demonstrated their grasp of history by taking on a character from the past. They learned about Reconstruction by reading the diaries of white teachers sent to the South. They wrote letters to local newspapers, or gave public speeches. "I've seen it as energizing rather than depressing," said veteran teacher Diana Porter. "It's assessment that is still standards-based, but students get to shape it a little, too." But alternative assessments had their problems. They could be difficult to score and costly to implement. Political pressure grew to find something more efficient, a pressure that eventually led to the standardized test- oriented No Child Left Behind law in 2002. With reauthorization of the federal law stalled in Congress, some see an opportunity to incorporate alternative tests into the federal mandate. Rhode Island lawmakers, for instance, have integrated alternative assessments into their state's testing system. But Dietel warns that the easy lure of simple test scores has not disappeared. "I wouldn't necessarily expect states to jump back on the alternative-assessment bandwagon," he said. "Even though a lot of states and a lot of schools would like to do it, a lot of people like looking at those regular test scores to see how their schools are doing." And when teachers and principals are judged solely by the test scores of their students, there will be little time for portfolios and letters to the editor, Porter said. "It's harder now to get teachers to stick their toe in the water and give it a try," she said. Should schools be held primarily responsible for improving student achievement, or do they need help from health and social programs to ensure their students’ success? Two sets of prominent educators and policy leaders released statements last week emphasizing different answers to that question. But both groups acted with the same purpose: to inform and highlight the debate over education in the 2008 presidential campaign and to influence the future of the No Child Left Behind Act and other policies of the next president. The Education Equality Project, formally launched last week by New York City Schools Chancellor Joel I. Klein and the Rev. Al Sharpton, the civil rights activist, plans to organize events at the Democratic and Republican national conventions to promote its message that “public education today remains mired in the status quo” and “shows little prospect of meaningful improvement” without significant changes in the ways schools are structured, its statement said. Check out the full report: " What Factors Predict High School Graduation in the Los Angeles Unified School District?" Experts say the exit exam is having a huge effect on dropouts. The UC-led report showed that middle school experiences and teacher quality were also major factors. The number of students graduating from Los Angeles public schools has declined for two straight years even as enrollment in the 12th grade has been rising sharply, new state data show. The graduation slump began when California started requiring students to pass an exit exam before they could receive a diploma. The data caught educators by surprise after they were quietly posted on the state Department of Education website. Separately, new research released this week indicated that only 48% of students in the Los Angeles Unified School District graduate on time. The latest figures are sure to stir new concerns about the ability of Los Angeles schools to serve the needs of the majority of their students, and revive a debate about the wisdom of mandating an exit exam, even one that has been described as requiring only about an eighth-grade education to pass. The Los Angeles Unified School District officially declared a 64% graduation rate in 2005-06, the most recent year for which a rate is available. District leaders have long disputed studies that have shown the rate to be under 50%. But district officials did not reject the findings of the latest study, released Thursday by the California Dropout Research Project at UC Santa Barbara. Perhaps the most in-depth study ever done of Los Angeles dropouts, it examined individual student transcripts for the class that began ninth grade in September 2001 and should have graduated in June 2005. "It's a good methodology," said Esther Wong, L.A. Unified's assistant superintendent for planning, assessment and research, who reviewed a draft of the study. "It's certainly better than trying to calculate it and do a best estimate." Wong did question whether the study might have understated the graduation rate by not accounting for students who transferred to other districts. But Jeannie Oakes, a professor of education at UCLA who oversaw the research, said such students were removed from the count of incoming ninth-graders, so they could not have tainted the findings. The study concluded that the low graduation rate for L.A. Unified can be explained in large measure by the quality of students' middle school experience and the quality of teachers at their high schools. "We've learned from this that middle school is just hugely important," said Oakes, who runs UCLA's Institute for Democracy, Education & Access. Although the dropout project is based at UC Santa Barbara, it relies on researchers at several institutions, and the study was conducted at UCLA. The study found that differences among schools -- for instance, the percentage of highly qualified teachers, the percentage of English learners and the status of the school as a magnet -- played a stronger role in predicting whether a student would graduate than "student factors," such as race and socioeconomic status. Magnet schools had a major effect on success. Nearly three-quarters of the students attending an L.A. Unified magnet high school graduated on time, compared with just 45% of those who didn't. Magnet schools typically offer specialized, theme-based instruction and were mandated by a court order to attract students of different races. The dropout study and the recently released state data foreshadow the release of new and potentially explosive statistics on the state dropout rate that are expected in mid-July. Because California has begun assigning new, statewide identification numbers to all public-school students, the dropout data are expected to be far more accurate than in the past, when there was near-universal acknowledgment that the numbers vastly understated the problem. Statewide, 12th-grade enrollment has been rising for several years, the result of a baby boomlet in the late 1980s. Meanwhile, the number of high school graduates has stayed stagnant. In Los Angeles Unified, the rise in enrollment has been steeper than for the state overall, yet the number of graduates declined from 29,744 in 2005 to 27,438 in 2007. The high school exit exam, often referred to by its acronym, CAHSEE, became a requirement for a diploma beginning with seniors who graduated in 2006. State and local officials widely agreed that it was the most likely cause for a decline in graduates. "I can't think of any other reason," said Keric Ashley, director of data management for the California Department of Education. "The CAHSEE does have some impact, not as much as some people thought it would." John Rogers, a UCLA professor who has studied the exit exam's effect on graduation rates, said he believes the state has downplayed its impact. The exam will hit the class of 2008 especially hard, he said, because for the first time, special education students had to pass the test. "In 2008, far fewer students will graduate than probably any year over the last 25 years," Rogers said. Figures for 2008 graduates aren't expected until next spring. Debra Duardo, the director of dropout prevention and recovery for Los Angeles Unified, said there were no surprises in the new data, and the dropout project study confirmed what district officials have assumed about the barriers that keep students from graduating. For instance, as others have done previously, the researchers pointed to algebra as a tripwire for many students. Seventy percent of students who passed Algebra 1 by the end of ninth grade went on to graduate on time. But the majority of students did not pass it in eighth or ninth grades, and roughly two-thirds of them failed to graduate on time. The study found that students who changed schools during either middle or high school had much lower graduation rates, including students who switched between the sixth and seventh grades. Duardo said the district is responding to those problems. She also said the study overlooked the district's recent success in keeping students in school, and on track to graduate, after they miss their normal graduation date. "If they don't do it in four years, maybe they can do it in five years," she said. Check the full report "Ensuring Equal Opportunity in Public Education How Local School District Funding Practices Hurt Disadvantaged Students and What Federal Policy Can Do About It" that includes the section "What If We Closed the Title I Comparability Loophole?" cited here by Roza. When Congress passed the No Child Left Behind Act in 2001, it rewrote much of the Elementary and Secondary Education Act, increasing the amount of testing required and demanding that states hold schools accountable for results on those tests. Although the changes were intended to hold school officials accountable for the educational experiences of disadvantaged children, Congress left intact a short clause in the main K-12 education law that, in practice, has failed to ensure that money from the federal Title I program only supplements state and local money, researchers and advocates said at a conference here last week. Researchers looking at a sample of California school districts have documented that the districts spend more on teacher salaries and other expenditures in low-poverty schools than in high-poverty schools. Thousands in Georgia, elsewhere take classes to help gain promotion. Thousands of incoming middle and high school students in Georgia will spend some of their summer vacations sitting at desks in hopes of earning a passing score when they take another crack at a challenging state math test. The disappointing scores of 5th and 9th graders on tests they must pass before moving to the next grade are an example of the struggle some states are having as they try to meet the requirements of the federal No Child Left Behind Act while raising their academic standards. And Georgia is among a number of states where students often end up attending district-administered summer school programs because they didn’t meet academic standards set by the state. Texas is one of several states in which summer remediation programs are specifically targeted to elementary school pupils who have not met reading targets by the end of 3rd grade. To check out the full report: "What Determines Student Success in Rural Schools?" ScienceDaily (June 19, 2008) — While most of the country focuses on ACT scores, student-teacher ratio and rigorous curriculum to increase student success, it may be the commitment to excellence that determines student achievement in rural schools. This is an overlooked, yet critical, factor when considering nearly half of American school districts are in rural areas, educating nearly 21 percent of all students. Perri Applegate, a researcher at the University of Oklahoma K20 Center, recently investigated the qualities that differentiate a high-achieving school and low-achieving rural high school, focusing on high-poverty high schools with at least 51 percent of the population eligible for free or reduced lunch. Applegate compared the scores on Oklahoma's Academic Performance Index, the state's annual school report of 367 Oklahoma high schools ranging from large, urban to small rural schools. She found no significant difference in achievement of rural schools and those in other settings. Surprisingly, the top factors that did impact student achievement in urban high schools, ACT scores and dropout rates, did not determine student success in rural schools. Community involvement and the school's commitment to student excellence were the determining factors in whether a rural school was high- or low-achieving. "In small-town America, the school and the community are dependent upon each other for success," said Applegate. In rural areas, schools tend to be the center of the community, acting as a gathering place and often social services. In larger towns, students have access to resources and support outside of their schools. "Rural schools in the study listed the same factors as impacting student achievement: poverty, parental support, community, extracurricular activities and a caring school culture," said Applegate. "The difference between a high- or low-achieving rural school was how they -- both the school and the community -- met those challenges." High-achieving schools had educators that embraced the role of being a rural teacher, which typically means wearing many hats and being creative with necessary resources. The schools had shared and supportive leadership, empowered stakeholders to take leadership roles and did not accept the idea that students were destined to fail based on their address. As one rural teacher pointed out, "Intelligence isn't geographically based." Other factors included parents and community members who support the teachers, or if necessary, the school enacted programs to increase support. Another key factor was high-achieving schools gave students many opportunities to connect their learning to the well-being of the community, reinforcing the school-community bond. While affected by the same variables, low-achieving schools felt that being a rural school was a handicap for student achievement and the lack of resources was a burden to school administration and the community. This attitude reflected in the educational approach of the school and in the student's probability to go to college. According to Applegate, these finding have serious implications beyond education. Research shows that schools can save communities. The success of one can determine the success or failure of the other. "We can't assume that student success in all schools, large and small, is impacted by the same issues," said Applegate. "So the question becomes how do we help schools in their environment become successful?" For rural schools, Applegate suggests preparation programs need to provide specialized training for those who will serve in this setting. Policymakers need to acknowledge that rural schools have particular strengths and weaknesses. Finally, reform programs aimed at improving rural schools need to be tailored to meet their unique needs. Here's the link to the full report: "High-Achieving Students in the Era of No Child Left Behind"
A new study argues that the nation’s focus on helping students who are furthest behind may have produced a Robin Hood effect, yielding steady academic gains for low-achieving students in recent years at the expense of top students. The study, to be released on Wednesday, compared trends in scores on federal tests for the bottom 10 percent of students nationwide with those for the top 10 percent and said those at the bottom moved up faster than those at the top. In tests of fourth-grade reading from 2000 to 2007, for instance, the scores of the lowest-achieving students increased by 16 points on a 280-point scale, compared with a gain of three points for top-achieving students, according to the study, by the Thomas B. Fordham Institute, a research organization in Washington. The period of big gains for low achievers and minimal ones for high achievers coincides with the federal education law known as No Child Left Behind, which took effect in 2002. The study said that while it was impossible to know whether the law caused those scoring patterns, such a result would hardly be surprising, since the law made it a goal to reduce the gap separating low-scoring, poor and minority students from higher-scoring white students. Under the law, schools are required to bring increasing percentages of students to proficiency in reading and math each year or face sanctions that can include the firing of staff members. As a result, many schools organize instruction around helping low-performing students reach minimal proficiency. In the debate over the law, little attention has been paid to the languid growth among high-achieving students, a trend with troubling implications for the nation’s economic competitiveness. Susan Traiman, director of education policy at the Business Roundtable, a group that represents business executives, said the challenge was to improve the ability of schools to educate students across a range of levels. New SAT is A) Better, B) Same, C) Longer? Definitely check out Fair Test's response to the "'NEW' SAT Validity Study". The writing section added to the SAT in 2005 has done very little to improve the exam's overall ability to predict how students will do in college, according to research released Tuesday by the test's owner. Critics of the SAT seized on the College Board's findings, which came three years after the revamped, nearly four-hour exam made its debut. "After all their ballyhoo about how the new test was going to be a better tool for college admissions, it's not," said Robert Schaeffer, director of the group FairTest. "It's longer and more expensive. That's all you can say about it." The College Board defended the SAT, saying that no predictor of college success is perfect but that the exam is a remarkably good one. It emphasized the finding that the writing test actually does a slightly better job of predicting freshman-year college grade-point average than do the math or critical reading sections, both of which are multiple choice. "Both tests are very valid -- the old one and the new one," said Laurence Bunin, the senior vice president who oversees the SAT program. "What's important here is that the new SAT places an emphasis on writing" and offers a valid test of another skill that is "critical to college success." The SAT runs three hours, 45 minutes -- 45 minutes longer than the old version -- and will cost $45 this year and next, up from $29.50. The ACT, the other leading college-admissions exam, has an optional writing section. The College Board added the writing test, including a 25-minute essay, in order to help colleges make more-finely tuned decisions concerning students' skills. College admissions officers can even download and read the students' essays. The multiple-choice sections were also changed somewhat in 2005. The College Board, a not-for-profit group, claimed the test would elevate the place of writing in high school classrooms. It backed up that argument last year with a survey reporting 88% of teachers said writing had become a bigger priority in their schools. From the start, however, some teachers criticized the exam, arguing it encouraged formulaic writing and was susceptible to coaching. The findings released Tuesday are the most comprehensive study yet of the new exam, covering about 150,000 students. The analysis measured the connection between SAT performance for the high-school class of 2006 and college grades. The correlation scale ranges from minus 1 to 1. A correlation of zero would indicate no connection between scores and grades, and 1 would show a perfect correlation -- basically, showing that students with high scores on the SAT are guaranteed to earn high college grades. The study found high-school GPA had a .54 correlation with college grades, which is considered fairly strong. Individually, all three SAT sections had lower correlations, but taken together they were .53. Combining high-school GPA with the three SAT scores was stronger still -- .62. But that was just .01 higher than if the writing exam weren't included. "No one in a position of responsibility can sever this lifeline right now and leave these kids adrift in schools that are not measuring up -- not when they have chosen to create a better future for themselves," Spellings said. The congressionally mandated study, conducted through the Institute of Education Sciences, the department's research arm, compared the performance and attitudes of students who had scholarships with those of peers who sought scholarships but weren't chosen in the lottery. Both groups took widely used math and reading tests, such as the Stanford Achievement Test. Overall, there was no statistically significant difference in performance. But some groups of voucher recipients showed improvement. For instance, among students who earned relatively high reading scores before the program started, those with scholarships progressed faster and are now about two months ahead of their peers. Students who previously attended struggling schools -- a group the program is designed to help -- showed no boost in test scores compared with their peers. Grover J. "Russ" Whitehurst, director of the institute, said one possible explanation is that those children lagged far behind academically and had trouble adjusting to what may be a more demanding classroom. Parents of students with scholarships were more satisfied with their children's new schools and were less likely to worry that schools could be dangerous, the report found. Students showed no difference in their level of satisfaction. A Memphis entrepreneur's documentary compares high-achieving students from India, China and America. It has drawn mixed reactions from academics. It was over dinner in Bangalore that Bob Compton began to suspect something was deeply amiss in the way America educates its young. Compton, a successful venture capitalist, was meeting with some of the Indian software engineers he employed. He soon found himself engaged in "the most interesting conversations I've ever had." He had expected math and science nerds. But they also knew more about history, geography and literature than most Americans he knew. "I said to them, 'How'd you get this way?' " he recalled. "They said, 'Well, at school.' "
That conversation launched Compton, 52, of Memphis, Tenn., on a mission. As both an entrepreneur and the father of 14- and 16-year-old girls, he wanted to know what schools in other countries were doing that American schools weren't, and why the United States performed so miserably on international student comparisons. The result was "Two Million Minutes," a one-hour documentary comparing the educational experiences of six students: two Americans, two Indians and two Chinese. The movie, in (very) limited release, begins with the premise that the high school years span roughly 2 million minutes. How is that time spent? Compton discussed the film, partially funded by the Bill and Melinda Gates Foundation and the Broad Foundation, over breakfast recently in Beverly Hills. Although the documentary has not been picked up for TV or broad release, he was upbeat about the effect it was having, mostly through college screenings and DVD sales. But something was bugging him. It was a discussion that had taken place after he screened his film at the Harvard Graduate School of Education. "I took a brutal beating," he said. Compton, who has run or founded several technology and medical firms, has an MBA from Harvard and thought he was on home turf. But one faculty member, Compton recalled, told him that "we have nothing to learn from Third World education." Another, renowned education theorist Howard Gardner, took him to task for comparing the U.S. with China. "His point was: How can you have a great educational system when you don't have freedom of speech?" Compton said. Compton saw the remark as missing the point: America may not have anything to learn from China's one-party political system, but it might want to know why Chinese students do better in math and science. Gardner, best known for his theory of "multiple intelligences" -- which holds that different people learn in different ways -- declined to be interviewed but sent an e-mail saying that the contrast among students in the three countries is "well worth pondering." "On the other hand," he wrote, "the movie's view of what education is, and . . . what it should be, is limited and deserves a response. While excellence in science, engineering and technology are worthy goals, it is equally important to learn about history, citizenship and the arts." "Two Million Minutes" focuses on high-achieving students from top schools in Bangalore, Shanghai and Carmel, Ind., a suburb of Indianapolis. All are impressive, but the American students come across as slackers by comparison. As the film begins, we hear the voice of Neil Ahrendt, an affable, well-spoken young man and a National Merit Scholarship semifinalist, saying: "Occasionally, I do homework." Then classmate Brittany Brechbuhl talks about the importance of balancing schoolwork and social life. Such balance appears rare in Indian and Chinese schools. Hu Xiaoyuan, one of the Shanghai students, wants to study biology in college but also excels at ballet and violin. Her schoolmate, Jin Ruizhang, is a math whiz who says he began pulling all-nighters in junior high. "Yesterday -- that was Saturday -- I got up in the morning at 5:45, got dressed . . . and then had two hours of tuitions; after that did a bit of math and physics and then went to breakfast with my friends; then after that straight to school, and . . . we had classes for three hours after that -- without a break." The clear message is that the Indian and Chinese students work a lot harder. The movie doesn't spend much time on curriculum or "rigor and relevance," the kinds of issues that dominate U.S. education discussions. The film quotes Vivek Wadhwa, a tech entrepreneur on sabbatical at Duke University, explaining why American students are slipping behind in math and science. "The hunger isn't there; the desire isn't there," he says. Chinese and Indian kids "are a lot more motivated to get into these fields and succeed, because they're fighting starvation, they're fighting hunger." How to compete with that? It isn't easy. Ahrendt, now at Purdue University studying computer graphics, and Brechbuhl, now at Indiana University, recently met in Washington with the two Indian students and found that they had a lot in common, including pop-culture tastes, and comparable goals. Still, Ahrendt said, "I think they just have more incentive to work harder. . . . You know, we have that incentive here, but it's not the same driving force." That is beginning to worry corporate America. Raytheon Co., for instance, recently launched a website, MathMovesU.com, aimed at exciting middle-school students about math. "We're very concerned about the technical competency of our future workforce," said Taylor Lawrence, a Raytheon vice president. The company, like others with sensitive government contracts, is required to hire U.S. citizens for many of its high-tech jobs. "There's a sense that if you look out 10, 15, 20 years, you don't have a very robust pipeline," he said. Tony Wagner, a Harvard education professor, was among those who watched Compton's film at its Cambridge screening and one of the few whose reaction was positive. Wagner studies innovation in U.S. education and has written a book due out this summer called "The Global Achievement Gap." Wagner said Compton hit a nerve at Harvard because he was confronting an implacable divide between the American business community and the education establishment. He agrees with Compton's central thesis. "We don't challenge kids in schools," he said. "We don't challenge them to think; we don't challenge them to create. We challenge them to get good enough grades to get into a good enough college." Wagner believes the solution is an overhaul of American education to emphasize innovation and critical thinking, not simply working harder at math and science. "I'm suggesting that Bob is right, but not that the answer is the Chinese or Indian model," he said. "In this country, it's a different challenge." Dallas Mayor Tom Leppert acknowledges that his public education projects won't by themselves slash the city's dropout rate or dramatically boost literacy. But by creating city-sponsored programs focused on specific high-need areas, Mr. Leppert has joined mayors around the country who are increasingly involved in education reform, even though their offices have little authority over city schools. Their reasoning is simple: A high-quality public school system is fundamental to urban renewal, to creating jobs, to keeping families from fleeing to the suburbs. In launching his four education projects – scholarships, summer jobs, early literacy and sprucing up old schools – Mr. Leppert has created programs that complement reforms under way in the Dallas Independent School District. And, if those are successful, more city-school ventures could be on the horizon. "In good communities, everybody works together," Mr. Leppert said. "Just this week, [DISD Superintendent] Michael Hinojosa and I were talking about some other problems we need to tackle." In some cities – Chicago and New York, for instance – mayors have actually wrested control of schools away from school boards and are now operating their city's schools out of city hall. But such instances are still relatively rare. By contrast, the efforts of Mr. Leppert and other mayors depend on their ability to marshal civic resources and to recruit corporate leaders to address specific problems that schools have identified. Mr. Leppert is relying on grants and corporate donations to fund his initiatives, and he's using his bully pulpit to call attention to the district's needs. "He's using his office to raise the public attention to the needs of children, and he's not working at cross purposes" with the school district, said Kenneth Wong, a professor at Brown University who has studied mayoral involvement in public education. "I would say he's right on track with what's going on nationally." Dr. Wong said he sees more school district/city government cooperation across the country. Children's issues – especially public education – play well with parents, and voters generally expect different government agencies to work together to solve big problems, he said. Parents "don't understand why mayors shouldn't be part of the [education] solution," Dr. Wong said. "Mayors are playing an important role – a more formal role – because voters see it as the mayor's obligation" to improve the health of the city, and that includes good public schools. Dr. Hinojosa said he does not expect Mr. Leppert's programs to work in isolation. He said the mayor's efforts were designed to complement DISD's Dallas Achieves! reforms. "[Former mayor] Laura Miller and I – we didn't talk on a regular basis," Dr. Hinojosa said. "... [Mr. Leppert] was the only candidate for mayor who came to visit me and ask what it was we needed." The two continue to meet regularly. But the work of mayors in other cities suggests that Mr. Leppert could go further. In St. Louis, for example, the mayor has successfully backed a slate of reform-minded school board candidates – twice. Denver's mayor helped negotiate a teacher contract and advocated for a controversial teacher pay-for-performance plan. In Stamford, Conn., City Hall oversees purchasing, payroll and IT for the school district. Dallas has dipped its toe in that water. As part of the 2002 school district bond campaign, DISD and the city built two city libraries on the campuses of two new schools. The facilities serve both as city libraries and as the schools' media centers. Mr. Leppert and Dr. Hinojosa said there have been no discussions about a further blurring of the administrative lines between City Hall and DISD, although Mr. Leppert said he is "open to anything." For now, both the mayor and superintendent seem content to build the mayor's initial four programs into successes, and then use them to launch more partnerships. "These programs are complementary right now," Dr. Hinojosa said. "We're going to see how these [programs] roll out. Will they work? We don't know, but they'll make for an interesting study." Summer internships: Corporations provide eight-week paid summer internships for above-average students from Adamson, Carter, Madison and North Dallas high schools. The program is designed to show students a "realistic view" of the corporate workforce and the education needed to be successful in it. College scholarships: $1.45 million available to students at North Dallas, Madison and Adamson high schools. Students must agree to mentoring, learning life skills and to maintaining at least a 3.0 grade point average. The scholarships, funded by corporate and private donations, pay the "gap" between the student's financial aid package and the cost of college. Operation Front Door: Corporations provide landscaping, beautification and other building improvements at 23 Dallas schools. Companies can pledge to projects ranging from $3,000 to $50,000. Ready to Read: Dallas public libraries provide early literacy programs for toddlers and preschoolers, such as story hours and phonics, as well as workshops for parents on how they can teach children the skills needed to learn how to read. This is really interesting, especially when considering another study recently posted to this site entitled "Students likely to fail high school exit exam can be identified as early as 4th grade, study says" suggesting that more tutoring money should be invested in lower-grades as a means of improving student test performance. Interesting comment made in this article regarding spending on tutoring: "All it's doing is taking money out of classrooms and putting it into the hands of private companies." "This isn't helping poor kids," said Jack Jennings, president and chief executive of the Center on Education Policy in the District, which monitors implementation of the federal law. "All it's doing is taking money out of classrooms and putting it into the hands of private companies." Jennings said that states don't have the capacity to monitor tutors effectively and that too many lessons aren't designed to build on the skills students learn in school. In Maryland, students served by most of the state's tutoring providers in 2006 did not outperform students with similar academic profiles who weren't tutored. But students in three of the 29 state-approved programs did make bigger gains. Steven M. Ross, executive director of the Center for Research in Educational Policy at the University of Memphis, which is conducting evaluations in Virginia, Maryland and several other states, said parents and educators generally give tutors good ratings. But, he said, "we're not seeing a big blip on the radar screen of raising standardized test" scores. Ross cautioned that the assessments involve a relatively small sample of students. He said that tutoring might be helping them learn but that the help might not immediately translate into higher test scores. Some students who have fallen far behind, he said, could make progress but still fail grade-level tests. Or students might need more time with tutors. "If I pour one gallon of gasoline in my car . . . I don't say it doesn't work if I don't go 100 miles," Ross said. Turning to private tutors when public schools fall short is a key provision of the 2002 No Child Left Behind law. Under the law, schools that don't meet test performance goals for two consecutive years must allow students to transfer to higher-performing schools. Schools that fail to make progress for three years must offer private tutoring to children from low-income families. Those that continue to fall short face further sanctions. As Congress considers revamping the law, the evaluations will fuel debate over whether tutoring is a wise investment. Doug Mesecar, an assistant deputy secretary of education, said that officials remain confident of the value of the tutoring program but that more needs to be done to ensure quality. "I think some providers are very effective as they work with students every day," he said. "The challenge we have is to figure out which ones they are." Education Department officials point to a Rand Corp. study last year that found tutoring programs improved reading and math performance significantly in several large urban school systems. In April, Education Secretary Margaret Spellings announced that she will use her administrative authority to promote participation in tutoring. Schools will have to improve outreach to parents about tutoring, and states will have more responsibility for ensuring that lessons meet students' needs. Spellings also wants to require schools to prove that they've made an effort to recruit students into the tutoring before spending those funds elsewhere. Nationwide, nearly 530,000 students -- 14 percent of those eligible -- participate, officials said. About 16,000 are in Maryland, Virginia and the District. As schools work toward a goal of having every student proficient in reading and math by 2014, the number of children in tutoring is expected to rise. The number of providers has tripled, to more than 3,000, since 2003. Kaplan Inc., a subsidiary of The Washington Post Co., operates such tutoring programs in Maryland, Virginia and other states. States have been slow to develop systems to gauge the effectiveness of companies and nonprofit organizations that work with students. Many schools report poor student attendance at tutoring sessions. Some school officials say that even with those challenges, tutoring is making a difference. Chicago public schools found that students who were tutored outperformed peers in reading and math. Tutoring in Hawaii and Colorado has been linked to gains in math. The District has not formally evaluated its tutoring programs, according to the office of State Superintendent of Education Deborah A. Gist. Evaluations are planned or underway in California, Texas, Florida and several other states. In Maryland, where about 11,000 students were enrolled in tutoring programs in 2006-07, school officials say they support the effort even if it isn't producing big swings in test scores. The state spent more than $10 million in federal funding on tutoring last year. "We see this is an opportunity for students to get ahead," said Maria Lamb, director of the Maryland State Department of Education's program improvement and family support branch. Lamb stressed that early evidence shows some students made gains. Mrs. Dowd's Teaching Service was one of two Maryland tutoring providers linked to higher 2006 reading scores. (Another was linked to higher math scores.) Eileen Dowd, a former Cleveland schoolteacher, said her tutors work with, at most, three students at a time. Children who struggle, she said, get one-on-one attention. Dowd's tutors work on campuses in Prince George's and Baltimore counties, enabling them to have close contact with teachers, she said. "It's collaborative," she said. "They will come and say: 'Tim is having a hard time focusing. What do you think?' "
Dianne M. Piché, executive director of the Citizens' Commission on Civil Rights, which supports No Child Left Behind, said the law gives low-income families access to a service that middle-class and wealthy families often use to give their children an edge. Piché said that schools and tutors should work together more closely and that after-school help should be offered in places accessible to children. "We need to push the schools and the providers to get it right," she said. The school board approves $400 million in cuts while avoiding teacher layoffs. But the action also includes forcing employees to take a four-day unpaid leave. The Los Angeles Board of Education voted Tuesday to slash about $400 million from the state's largest school system by cutting 507 administrative staff and clerical workers and requiring that all employees take a four-day unpaid leave. The board's action avoids the heavy teacher layoffs and class-size increases that are facing smaller school districts throughout the state. Based on the current state budget, the Los Angeles Unified School District would have to make more than $700 million in cuts over the next three years, barring restored state funding, and could be forced to pack more students in classrooms after next year, board members said. "I'm concerned about the viability of doing business on a day-to-day basis" in the future, said Richard Vladovic, one of six board members who voted to approve the budget reductions. Board member Marguerite Poindexter LaMotte abstained out of concern that programs targeting minority, low-achieving students would be adversely affected. The cuts are a result of Gov. Arnold Schwarzenegger's latest proposed budget, which provides a $193-million increase in state education funding over last year but does not provide a cost-of-living increase and does not fully fund certain programs, which will have to be paid for with unrestricted general fund money. Last week, L.A. Unified estimated that it would still face a nearly $370-million shortfall in its $6-billion budget, but because of lower than expected revenues, the district had to cut $402.5 million Tuesday. District administrators and board members said they wanted to keep cuts as far from classrooms as possible. As a result, the majority of reductions will come from such actions as reducing payments to injured workers and delaying textbook purchases. The board voted to eliminate a total of 680 jobs, including 65 math and reading coaches, 19 school nurses and 19 counselors. One hundred and seventy-three of those positions are vacant, and many affected employees have "bumping" rights, meaning they could still be employed but would take pay cuts and displace less senior workers. District officials did not issue preliminary layoff notices to any teachers earlier in the year, although the district is not legally required to notify probationary teachers that they could be let go. But Roger Buschmann, the district's chief human resources officer, said teachers are safe. "I do not anticipate releasing any teachers. Zero," he said. Districts throughout the state, including Santa Ana, San Diego and Rialto, have been issuing preliminary pink slips to balance their books. The majority of non-classroom jobs targeted for layoffs -- about 240 -- come from the California School Employees Assn., which primarily represents clerical and technical employees. "Some of the cuts made sense, but the ones in human resources and personnel are going to have devastating effects. . . . There will be a trickle-down effect to schools because people won't know who will answer their questions," said Connie Moreno, a union representative. Supt. David Brewer acknowledged that "services that matter are being cut." Three divisions were spared the budget ax, including the Innovation Division, Brewer's signature academic reform initiative. The school police department will not be trimmed, and neither will the budget of recently hired Senior Deputy Supt. Ramon Cortines, who has made enhancing student safety a top priority. The board also only trimmed $3 million from the janitorial program, about half the originally proposed amount. "Clean bathrooms were an important thing we needed to preserve," said Chief Financial Officer Megan K. Reilly. The board also approved a mandatory four-day furlough that would save $54.4 million over the next year. Officials have not worked out details but Cortines said he hoped to target the district's best compensated employees for the unpaid leave program. "The lowest paid are the ones who can least afford that kind of situation," he said. United Teachers Los Angeles President A.J. Duffy vowed to fight any forced unpaid leaves. Over district objections, the union successfully staged an hourlong teacher protest last week during school hours and has threatened to schedule further actions. "I don't care what they do, they can sell [headquarters] for all I care. If they impose furlough days, we will mobilize against that," he said. If the district cuts more from their downtown offices on Beaudry Avenue, Duffy said the union would back down. The board authorized nearly $55.4 million in cuts from central offices. "That's just not enough," Duffy said. The board could authorize further cuts this summer. "We've done a lot of shaving," Cortines said. "You can shave to a point where a program is no longer meaningful, which means you might have to look at elimination." LaMotte said that some of the cuts would unfairly target programs that help minorities, including the Ten Schools Program aimed at the lowest-performing schools mostly in South Los Angeles, and said she was concerned that racism played a role in the decision. "I hate to put the big 'r' word on the table . . . [but] the darker the skin, the deeper the cuts," said LaMotte, who is African American. Board member Tamar Galatzan, whose San Fernando Valley district includes some affluent neighborhoods, took issue with the suggestion that schools serving poor students were unfairly targeted. "This doesn't just have to do with some high-needs schools," Galatzan said. "This is kind of a lose-lose for everybody . . . regardless of the color of your skin and how much money your parents may have." Brewer headed off a possible argument over whose schools fared worse. "This is a forced budget. Obviously, when a family comes under attack, it's time to pull together, not fall apart." By Michelle García, The Washington Post. Posted June 14, 2008. "The land is our birthright in this place now called Texas, and its history contains our Gettysburg, our Trail of Tears, the seeds of our culture." Under a lavender canopy of jacaranda blossoms within sight of the embattled frontier, Luis Pea imagines an unintended and comical use for the future border wall. "If anything, it will be a new sport. People will pole-vault," says the biology student with thick black hair. He kicks up a long leg and shouts, "Salto con garacho!" ("a high leap to garacho music"). Cue the Mexican violins! Laughter erupts from his fellow nature lovers from the Gorgas Science Society. They are here, after all, to chant "Don't fence us in" in protest of the 60-foot-high wall that will slice straight past their border-side campus -- which combines the University of Texas at Brownsville and Texas Southmost College -- and right through the Rio Grande Valley borderlands. I laugh weakly. I'm feeling dejected. Jokes about pole-vaulting, about lizards doomed by the wall, aren't what I expected when I trucked down to the very tip of my home state. I'd expected indignation about the border wall. I expected people to take it as personally as I did, like a slap at my identity, my South Texas culture, the Mexicanness in my Americanness. Pea invites me to see a campus monument marking the old war between Mexican and gringo: an old cannon standing erect along the Rio Grande. Check it out, he says. "This might be your last chance before the wall goes up." The cannon sits on the wrong side of the planned wall. Pea and I stroll through the campus, with its buildings of somber desert browns and reds and its sky-blue tile domes of Spanish-Moorish influence. This once was Fort Texas (later renamed Fort Brown), erected in 1846 when the United States charged the original southern border at the Nueces River and invaded Mexico to push the frontier 123 miles south to the much-coveted Rio Grande. What once was Mexico suddenly became the United States. As we walk toward the river, it's jarring to see the bullet-riddled walls of the campus's buildings -- a reminder of the old border battles. "All of this is battleground," says Pea, his playfulness quieting to philosophical musing. "These are bloody grounds." "They fought for it," he says of the United States. "But it's 'the enemy' that's left," he adds ironically. The war might have ended, but people like us, like Pea and I, still are regarded as the enemy by some. We are the outsider with a Spanish-infused drawl, with a song of love and valor in our hearts; the pickup-driving, boot-wearing, Stars and Stripes-waving Tejano. But Texans sometimes refer to us as "Mexicans" even now, when you can find a military veteran in nearly every family, and many of our families in these parts are as old as the mesquite tree. "We have American flags, we recite the national anthem. But what do we have to do to be plugged in?" Antonio N. Zavaleta, a vice president at the university, asks effusively. He is a great-great-grandson of Juan Cortina, who led an armed rebellion in 1859 against Manifest Destiny and the new Anglo social order that aimed to subjugate the Tejano. "And this border wall," Zavaleta continues, "is further indication that the world ends from a line from Corpus Christi to Laredo and everything down is a buffer" between the United States and Mexico. With my pickup truck radio tuned to country and old-school rock, I ride the highways of the South Texas brush country pursuing the roots of the resistance heard now along the borderlands. My journey takes me north on U.S. Highway 281, where I pass fields of sunflowers bowing under a relentless sun like mourning widows. The mesquite and brush rustle under the massive sky and here, gazing across the vast chaparral, I'm overwhelmed by the historic resilience embedded in the terrain unfolding before me. This was the region where my family -- and countless others -- defended their land more than 150 years ago and have fought for a place under the new flag hoisted above them. When I arrive at a family reunion in the San Antonio Hill Country where my paternal grandmother's clan has gathered at an uncle's ranch retreat, it is family and land that my elderly tias (aunts) are talking about. "The rumor was that he had been poisoned," says one tia, Berta Guerra, retelling the story of the early demise of my great-grandfather, Mauricio Gonzalez, who mysteriously died after attending a political meeting. "This was my grandfather and my great-grandfather," Tia Berta croaks into the microphone, standing before picnic tables filled with a young generation of teachers, lawyers and journalists. "They were big-time ranchers," she says. "They had cattle drives to Kansas, just like a John Wayne movie." The Gonzalezes owned massive acreage on both sides of the Rio Grande and did a good job of holding onto it -- until they, along with other wealthy Tejanos, bankrolled a coup attempt in 1891 against the Mexican dictator Porfirio Daz. Catarino Garza, my great-great-uncle, a journalist who married into the family, led the would-be revolution. Anglo Texans branded him a social agitator for stirring up trouble with Mexico, a key trading partner, and for firing off missives to newspapers criticizing Anglo "racists." United against him, Mexican and U.S. forces put down the rebellion, and Garza fled to Latin America. But the story does not end there. I follow the Garza paper trail up to the Texas State Archives in Austin, adjacent to the plantation-like state capitol and its assemblage of statues honoring Confederate and Alamo fighters. Sifting through handwritten Ranger reports penned with flourish and suffused with panic, I find this: "Garza was imported to cause race feelings and contests and it may result in a desperate state of affairs, as in a war of races if not stopped in time." It was as if the Ranger who penned this 1892 report could not comprehend that Garza gave voice to the growing frustration of Tejano ranchers and cowboys at the land-grabbing Anglos; that they might be just a little sick of being treated like a "mongrel race," to use a common insult of that era. A short walk from the state capitol, at the Hideout Theater, the film Border Bandits is upending some of the tall tales from that era of revolution -- tales like the looming race war -- and replacing them with a bloody history most folks don't know about. The film centers on the recollections of Rio Grande Valley ranch hand Roland Warnock, who in 1915 witnessed Texas Rangers shoot two unarmed Tejano ranchers -- both U.S. citizens -- in the back. During a Ranger-led border crackdown to root out so-called Mexican bandits and suspected sympathizers, meaning anyone with a Spanish surname and two good legs, lawmen and vigilantes killed 5,000; thousands more abandoned their ranches and fled to Mexico. A postcard memorializing the border crackdown flashes across the screen, featuring three mounted Rangers with their lassos tied around dead "Mexicans." But were they really "bandits"? About midway back to the border, at a converted ranch house with creaky wood floors that now is the Kenedy Ranch Museum, historian Homero Vera fills me in on the back story for the "Border Bandits" film. "They were revolutionaries, they had their ideals," Vera explains. "They called them bandits because they were hostile, because they did kill some Anglos." Spurred by the film, state Rep. Aaron Pea (D) proposed a bill in 2005 to teach this largely ignored Ranger history in Lone Star schools. The bill died in session. Pea never revived it. Faced with the outcry over 21st-century Mexican immigrants, Texas, he said, wasn't ready to look back at injustices committed against Mexican Americans in the distant past. "It's a less tolerant environment -- a xenophobic political environment -- that we exist in today because of the immigration debate," he says. But the 1915 Ranger campaign wasn't directed at immigrants, I say. It was directed at Tejanos, meaning: U.S. citizens. Fear, said Pea, made such distinctions irrelevant to Anglos of that era. A few years ago, as part of a push to get a veterans' hospital built in the region, Pea joined Rio Grande Valley vets on a march to the Alamo. But theirs was far from a hero's welcome at that Texas landmark of freedom. Says Vietnam veteran Max Balmadez, "They said we were trying a Mexican takeover of the Alamo." As if they were foreign. As if they didn't belong. I'm preparing to leave Texas, and Homero Vera and his wife, Letty, invite me to dinner at a steakhouse, where Homero hands me a thin book, El Mesquite, written by Elena Zamora O'Shea, one of our cousins, in 1935. Narrated by a wise old mesquite tree, it is the story of our ancestral roots in this region and how we came to be marooned in our own country. "If they were Spaniards when governed by Spain and Mexicans when governed by Mexico, why can they not be Americans now that they are under the American government?" O'Shea wrote. I've experienced what O'Shea describes, like when a border patrol agent once saw me in my pickup and pulled me over. "Are you a citizen?" were the first words out of his mouth. It's even happened to a couple of Tejano judges who were deemed suspicious and detained. I remember one of my last conversations with my father three years ago, in the quiet of a Corpus Christi night as he lay in his hospital bed. He repeated his sacred promise. "I'm leaving you kids the ranch," he said quietly. "It's yours to do with what you want." And with his passing, he did just that, bequeathing a history that transcends borders. The land is our birthright in this place now called Texas, and its history contains our Gettysburg, our Trail of Tears, the seeds of our culture. The land proves we've been here, we belong here. On these treasured memories, these beloved bones, that dreaded wall will rise. Michelle García, a native Texan, recently completed a Knight fellowship in El Salvador with the International Center for Journalists. She is based in New York.